Just had to get that surprise moment out of the way nice and early. Are you all settled back down now? I hope so. Maybe a nice cup of tea (or brandy – I won’t judge) at hand? Okay. Let’s get this over with… Over Christmas I totally went dark side (I blame The Force Awakens, y’all!) and left the safe harbour of garment sewing and dipped my toe into the quilting world… I know, I know. Past Amanda said there was no way that these gentle gorilla paws would ever stitch a quilt. Bah! She obviously hadn’t been seduced by the wonder of a black and white baby Gramanda (grandma + amanda = gramanda) quilt. 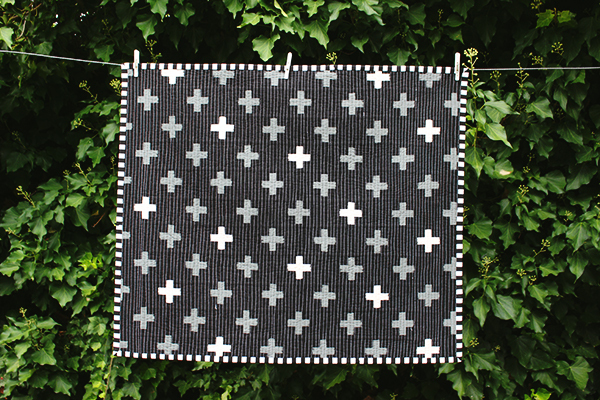 This is the black and white modern baby quilt by Simple Simon and Co. Try and say that one fast five times! I thought this pattern was tops but let’s real talk: I know nada about quilts. What I do know are things I like – geometrics and monochrome. And after spying some of Qvilted’s amazing work in #bpSewvember I found my gateway quilting drug. Based on her suggestion I decided to give this project a whirl. Thanks, Yara! Also, if you haven’t checked her stuff out before, do so now – it is awesome! Now, this pattern is meant for tiny peeps. Which is great if you are a selfless sewasaurus. But this lady is most surely not, so I view this as my Gramanda lap rug for knitting on the couch with the dogs whilst binge watching Sens8 or Agent Carter. I (wisely) decided to go with something small to start with, as I had no idea if this quilt thing would be my bag. Also because I am crazy competitive and wanted to make sure I could finish this thing. You know, the normal reasons for wanting to make something. How super quick it was. This sucker is sized for a baby cot so it is tiny. All hail the speed of making itty-bitty things! The easy to follow tutorial. Because this was a lady who likes to follow instructions. The fabulous design. The urge to make a big one of these is pretty high. It’s so cool! Go with the fluoro green bias binding I made but was too chicken to use. Bawk! Make a big one for a proper couch snuggling blanket. Quilt tunics are so hot right now, right?! Hey this is fantastic! I was ogling it on IG when you posted. Lord knows I don’t have the patience for quilting ATM but if I was I’d be totally copying oops I mean, be inspired by the designs of Lindsay Stead who makes the most gorgeous simple modern quilts. Love it! The black and white is so cool! I have NEVER quilted but this sort of makes me want to “dip the toe” so to speak. I think small is the way to go…. I just love your side of +Quilt . I made one in the Schades Black , dark Blue , Blue , light Blue and White , the pluses is White the whole way down . I gave to my boy Sebastian for Christmas . Your quilt looks flawless! So tidily stitched. I want to quilt more, to justify all the scrap-hoarding I’ve been doing. Some of the more minimal designs I’ve been seeing are awe-inspiring. This is gorgeous!! Your quilting looks perfect! So glad you did this right, with gin. Always happy to be speed dial. You rock! As ever Amanda, you crack me up – Gramanda Quilt, awesome! And what a fantastic quilt! I’ve spotted your progress posts on IG but don’t think I’ve seen the full beauty of its finished self. It’s gorgeous, bloody well done for tackling such a scary (to me) project! Oh wow this is just so gorgeous!! I love the geometric pattern and the simplicity of it. I just made my first baby quilt but now I really want to have a go at this pattern, maybe in chambray/denims and white, and for myself this time! I love this so much!! 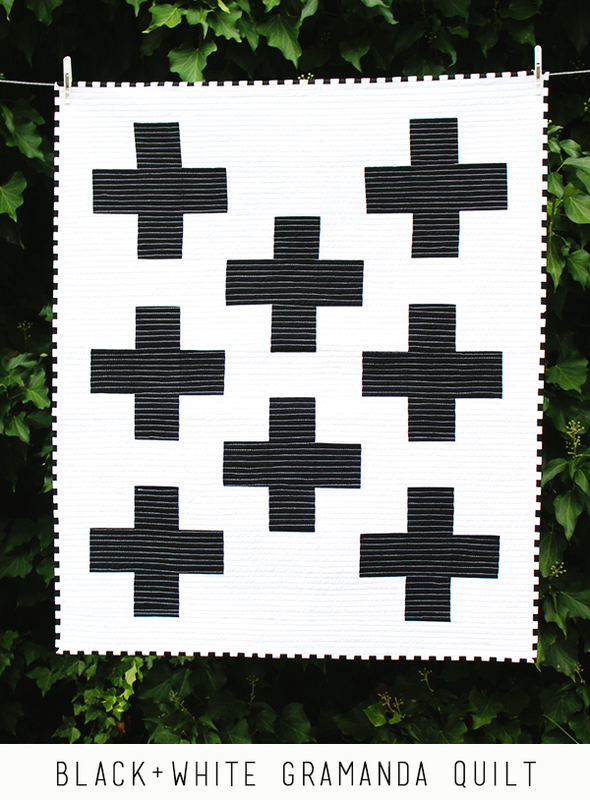 I’ve been itching to do more quilting this year and I love the plus sign patterns I’ve seen around. The black and white is especially chic! Um how did I miss this? I am in love with the monochrome. I too have dipped to the dark side when I was pregnant with my kidlets. I blame the hormones!!! Your quilt however shits all over mine. It is freaking incredible! Absolutely love this! I made my first quilt about a year ago…I’ve now made 6! :O They are good for when you’re sick of fitting muslins and want something 2D to sew! I’m a big fan of ‘natural’ straight lines too. Love your work!